It is time the world recognizes that Pakistan is more of a criminal enterprise, than a nation. The nation has been hijacked by mullahs who are breeding religious intolerance and hatred. Pakistani nation is generally not pro-extremists. This is amply reflected in the outcome of elections where no religious party has ever got any mandate to rule the country. 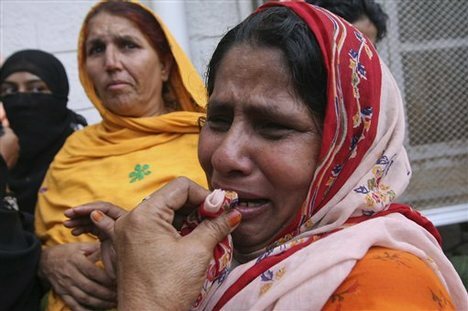 The poor people of Pakistan are being held hostage to gun-carrying extremists. The post amply explains why no one openly challenged these extremists. When a country establishes a state religion, it means that every political party has to compete to conform to that religion. In Pakistan’s case, it just so happens that politicians have tried to outdo each other in building upon ever narrower definitions of the state religion. Distinctions between religious and non-religious parties are meaningless in such a milieu, since they would all be part of the religious right in a secular state. Given that there is not much difference in the costs to be paid, Pakistani politicians would do well to dump the state religion in favor of a secular constitution. The smiling face of the cold-blooded murderer is the face of pure evil. Is he an exception or the norm in Pakistan? One has to wonder. Unfortunately, this kind of religious fanaticism is too deeply entrenched in Pakistan to be uprooted now. The country can thank their ‘establishment’ for this. They fanned the flames of religious extremism to get a so-called ‘strategic’ advantage. Now the flames threaten to obliterate the nation itself. Too late to do anything now. Watch for more upheaval from here on. @Ben, it is easy to see why nobody openly challenged these religious extremists. They would have ended up like Salman Taseer. Would you do it openly? Pakistan came into being to serve the cause of “Islam”, not secularism. Hopefully you’d make your peace with the reality of Pakistan soon enough. btw, your blog is anti-Islam and anti-Pakistan. « Musharraf sees his chance in Gilani’s imminent dismissal….